Does getting liked or followed on social media result in more sales for your business? Should you be blogging, Facebooking, or otherwise engaging with people on the Internet as part of your Marketing Strategy? Like most business owners, you are probably scratching your head to figure out whether social media is a feel-good strategy or one that actually generates sales. 70% of Americans have at least one social media account. No matter who you serve, you can’t find a better place to serve it up than social media. The first step is deciding what you want to accomplish with your social media campaign. Your campaign goal can be anything from getting likes (so you keep showing up in their Facebook feed) to requesting more information (like a quote or downloading an information sheet) to making an immediate sale. We’ve created a step-by-step process to walk you through an entire social media campaign that shows results. You’ll never guess again what to do or whether that investment paid off—you’ll have the stats (and the sales) to prove it! For more marketing straight talk like this, be sure to get our free Digital Marketing Strategy Guide right now. 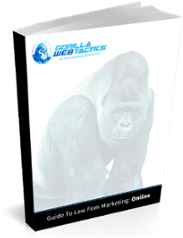 Inside, you’ll discover how to boost your social media signals to make more sales—plus seven more hyper-specific secrets to online marketing in the simple, no-nonsense language you’ve come to expect from Gorilla Webtactics.